This Sunday, May 1st, the Madison County Historical Museum will open for the season, featuring a new exhibit dedicated to our historic downtown square. If you haven’t toured it recently (or ever), you’d be amazed at the vast quantity of local history contained within 14 buildings on 18 acres of land, on the hill at 815 S. 2nd Avenue (near the hospital). The society was founded in 1904 and has existed in its current location for 36 years. Through October 31st, they’ll be open Monday – Saturday from 11:00 to 4:00 and Sunday from 1:00 to 5:00. My favorite area is in the basement. 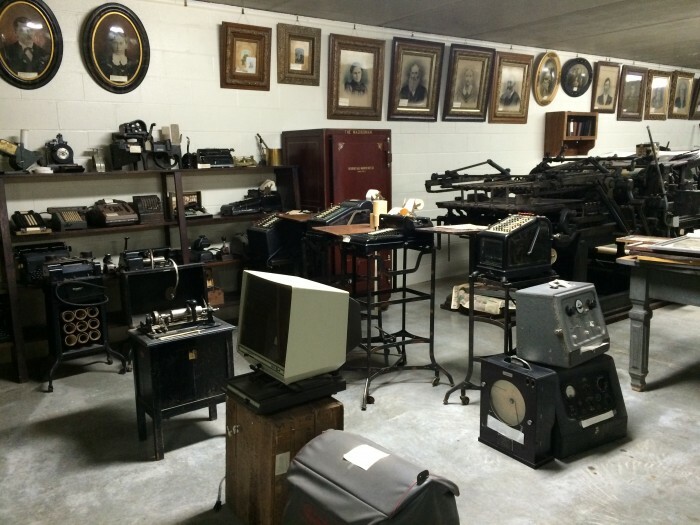 All this old technology from local businesses fascinates me! 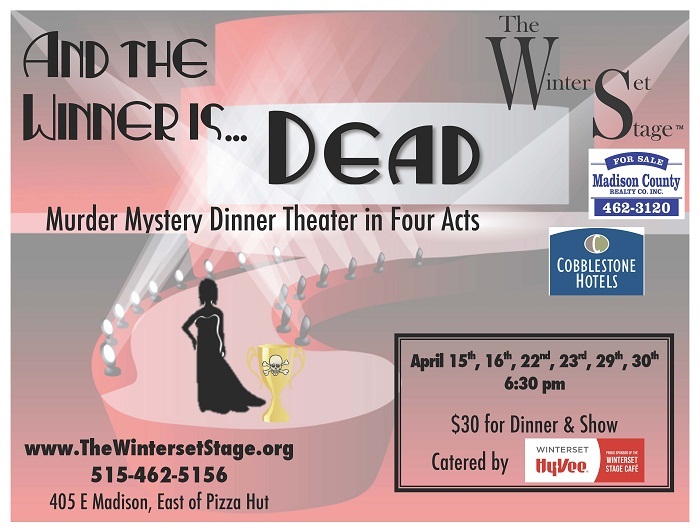 This weekend is your last chance to experience the Murder Mystery Dinner Theatre put on by The Winterset Stage this Friday and Saturday evening at 6:30 pm: “And the Winner is Dead.” The show has been a tremendous success with sellout crowds, and only a few tickets remain for the final performances. 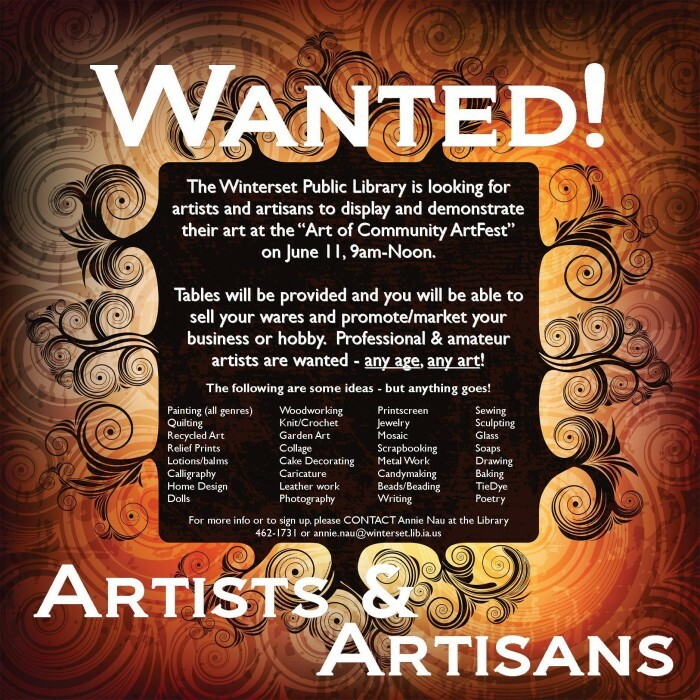 Call The Winterset Stage today to see if you can secure one of the last remaining seats. 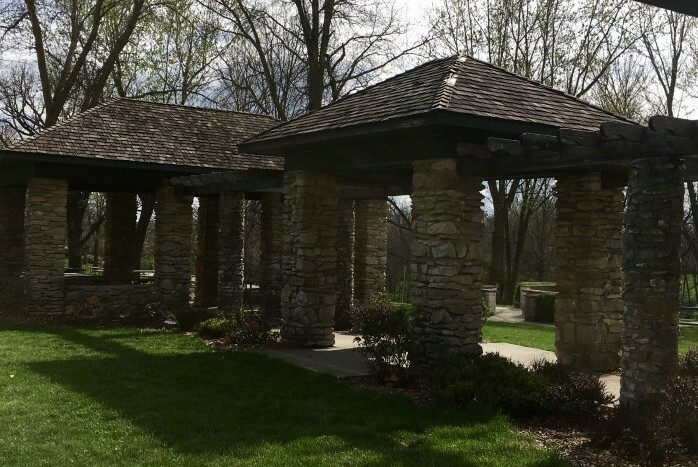 To celebrate the close of Child Abuse Prevention Month, take the family to enjoy the Picnic 4 Prevention at the Arbor Shelter in Winterset’s City Park on Saturday, April 30th from 11:00 am to 2:00 pm. The event includes bag lunches by Hy-Vee (first come, first served) and football and frisbee giveaways while supplies last. The kids can also enjoy Paint4Prevention, Bubble Pool, Plant4Prevention with the ISU Extension Master Gardeners, a Piñata, and Prevention Pledge. Bring your own blanket! 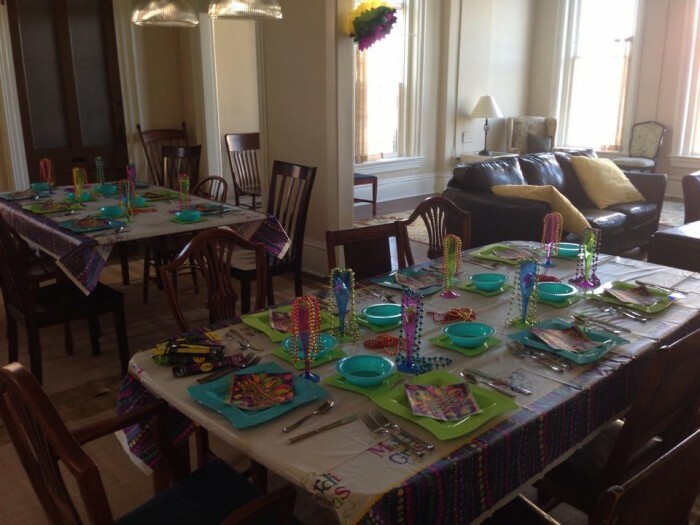 Children must have an adult present to participate. Picnic4Prevention on Saturday from 11:00 to 2:00. Thank you to all who have helped with Child Abuse Prevention Month activities for our community! The Madison County Cycle Club is asking for volunteers to help with a “collective triage” this Sunday at 1:00 at Rich Mills farm, 1867 Hogback Bridge Rd. They need help with stripping bikes to reclaim parts for the collective that will be used on refurbished bicycles. Please bring your own tools. 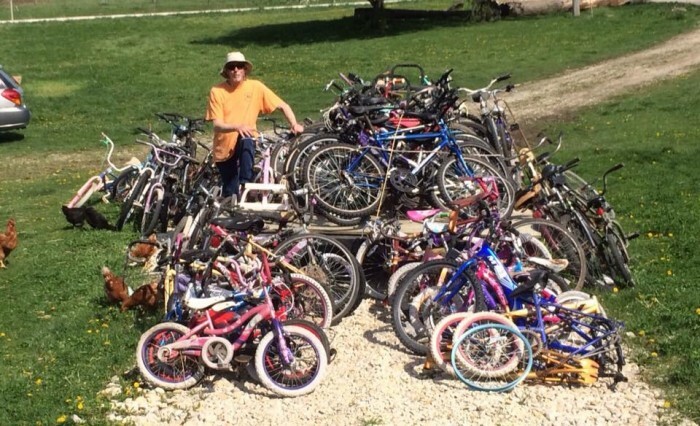 For many years the Madison County Cycle Club has had a good relationship with the Des Moines Bicycle Collective and the bikes you’ve seen on the Medicap parking lot in town is part of that effort. Hundreds of restored bikes have come back to Madison County residents from these two groups. For more information, call Rich at 462.9097 or email coveredbridge@yahoo.com. 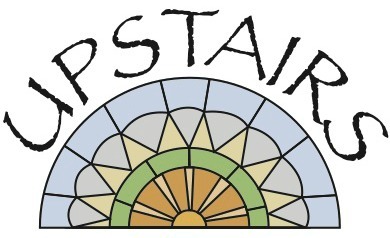 The First United Presbyterian Church in Winterset is hosting its Annual May Breakfast on Tuesday, May 3rd from 6:00 am to 9:00 am. They’ll be serving eggs, bacon, sausage, biscuits and gravy, muffins, sweet rolls, coffee, and juice. This is their 78th annual event! 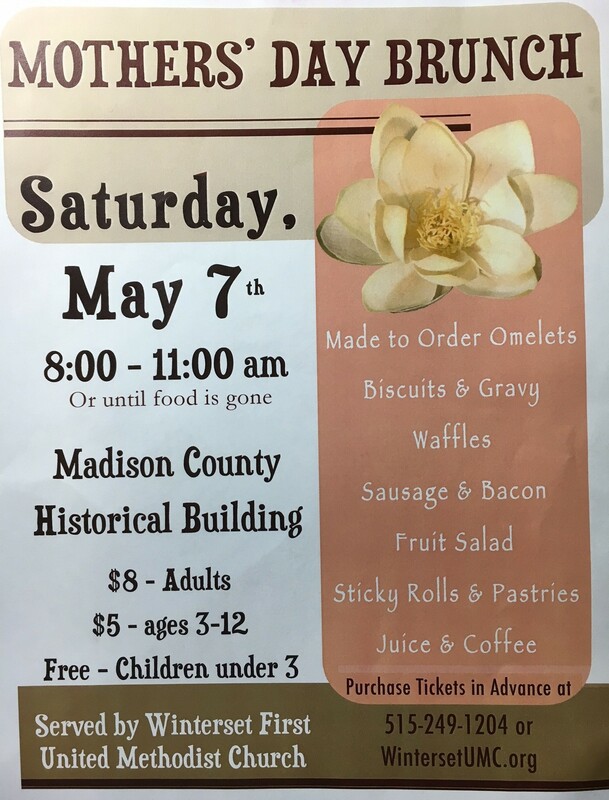 On Saturday, May 7th, the First United Methodist Church is hosting a Mother’s Day Brunch at the Historical Building from 8:00 to 11:00 am, or until the food is gone. Tickets can be purchased in advance at the church (call 515-249-1204). Winterset High School is hosting 14 bands and 16 choirs on Friday, May 6th for the 2016 Iowa High School Music Association State Large Group Contest, and the Band Boosters need your help to create a successful event. The shifts have been planned to try to work around performance times. Click here to view the volunteer sign up sheet online. Volunteers should check in 10 minutes early at the high school’s main office to pick up your name tag and job description/location. 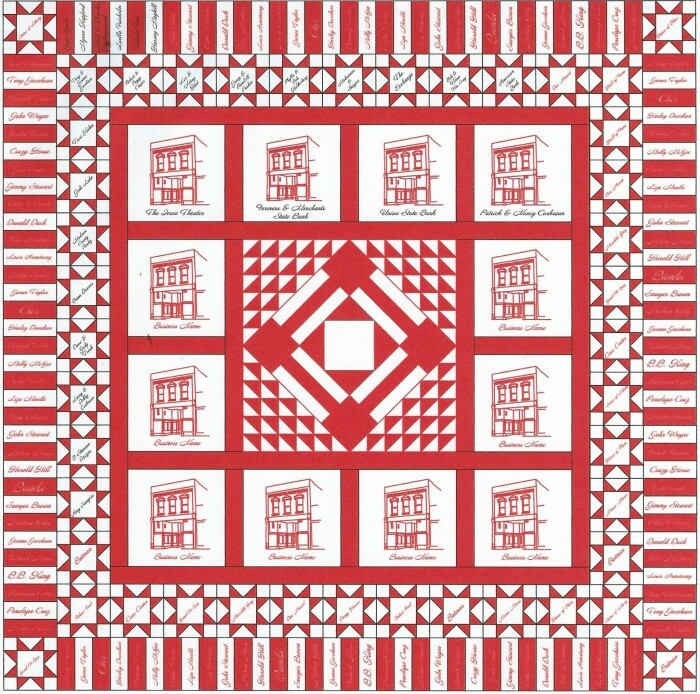 If your mom has “everything,” think about honoring her this Mother’s Day with a block on the Iowa Quilt Museum’s inaugural Red and White Quilt. For a $100 donation to the museum, your mom’s name will forever be displayed in the museum on this beautiful quilt. Now that’s love! Donations can be mailed or dropped off at Village Bootery with Terri Kuhns, treasurer of the IQM. The museum will have a soft opening on Memorial Day weekend, in time for the John Wayne Birthday Celebration, with a grand opening to follow in June. Bring your coloring books and colors to The Cellar at 111 S 1st Ave. on Friday, May 6th from 6:00 to 8:00 pm. 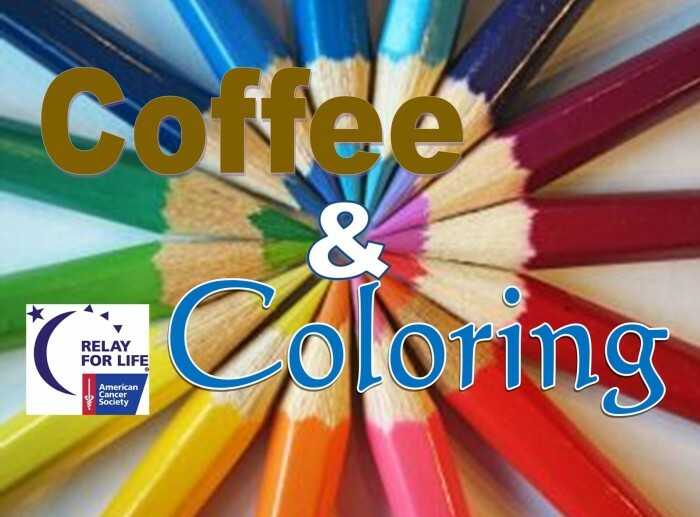 Coffee & Coloring will support the American Cancer Society with a tax deductible $25 donation for the 2016 Relay for Life of Madison County. Enjoy a dessert and a selection of cappuccinos or lattes while spending time with fellow coloring fans. Relay For Life of Madison County is Friday, June 3rd from 6:00 to 11:00pm at the Winterset High School. Sign up this week to reserve your t-shirt size. Register up online here. If you enjoy volleyball, join the Winterset Park and Recreation Department’s Coed Sand Volleyball Tourney. Sign up in teams of four: two men and two women. Champion T-shirts will be awarded to 1st place, and all proceeds go to the Winterset Dog Park fund. 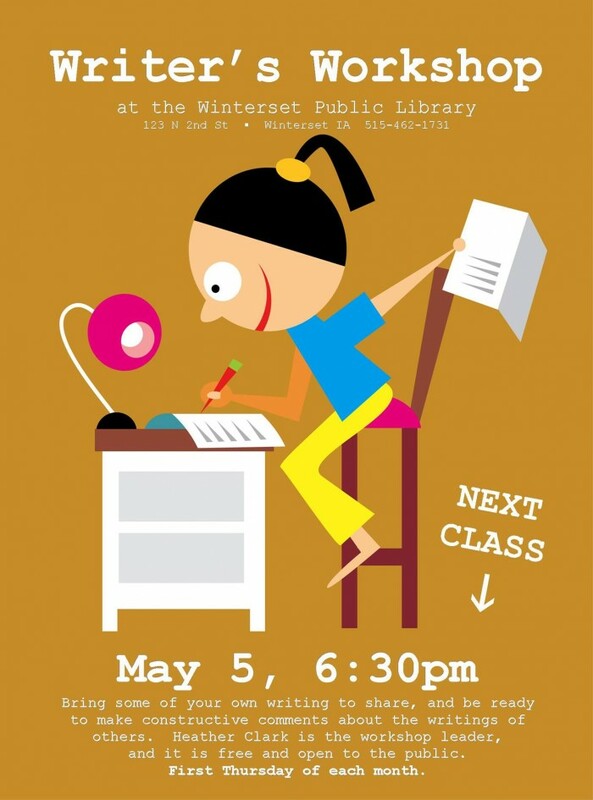 Registration ends Friday, May 6th. Fee is $40 per team. The City-wide garage sale is coming May 14th! Ad information is due to The Shopper by May 6th if you want your sale included on the map. 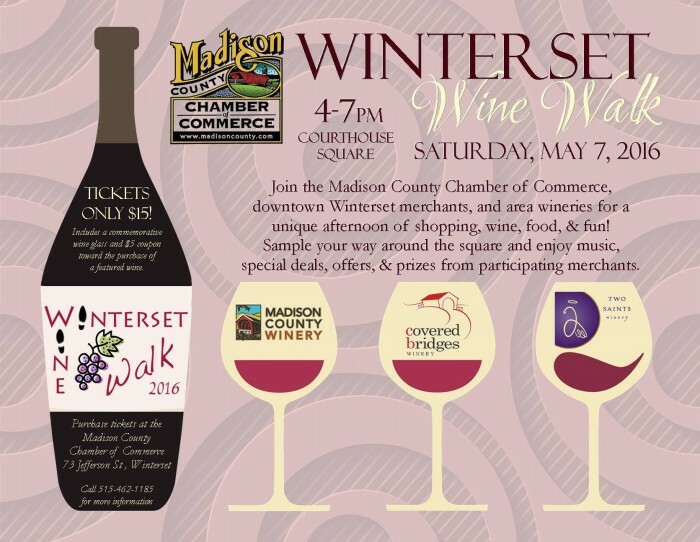 The Winterset Wine Walk is next Saturday, May 7th. $15 gets you a souvenir wine glass, plus a $5 coupon to use towards the purchase of a bottle of wine that evening. Tickets are available at the Madison County Chamber of Commerce office, or buy them online here. 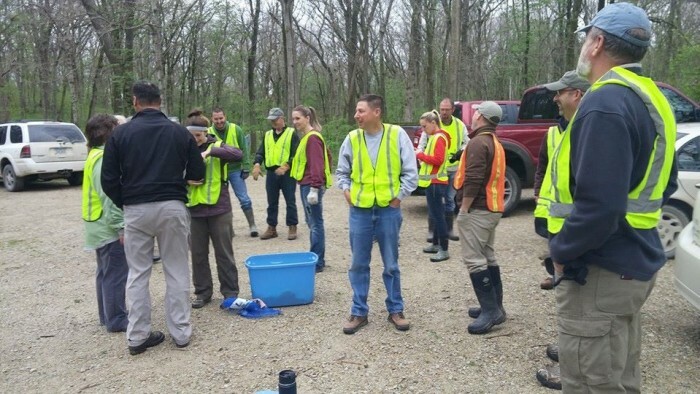 Finally, thank you to all the Madison County Chamber members and the Madison County Conservation Board for volunteering on Earth Day to help with road-side cleanup! Thanks, also, to the many organizations who have adopted highway areas around the county and help keep them in good shape. Your efforts are appreciated. 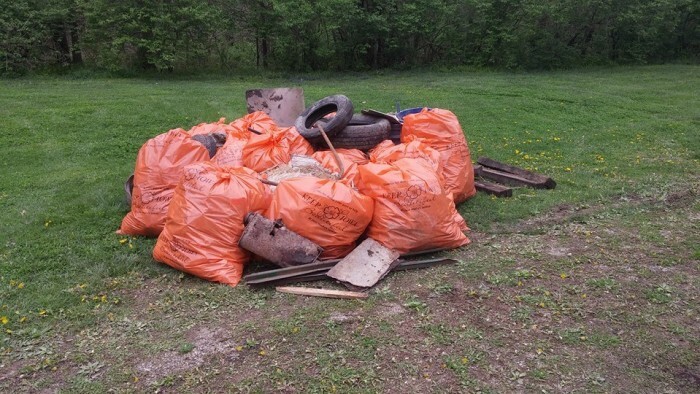 In a little less than 3 hours, 2 dozen workers gleaned this pile of debris that had been discarded along Clark Tower Road at the SE entrance to Winterset.